Yesterday I officiated a wedding for a Hungarian bride, which was quite different from most weddings I attend, but it got me thinking of wedding traditions here in the Cayman Islands. Of course many Destination Wedding brides embrace wedding traditions they are familiar with at home, like "something old, something new, something borrowed, something blue" but at Simply Weddings we like to incorporate some island traditions as well. Most of our wedding traditions come from the British, since we are a British country, and some we have adapted to give them our own island style. Here are the three most popular Caymanian wedding traditions. In Cayman, the groom always opens the first bottle of champagne, which the couple will use to toast each other. This is usually done with a great deal of hilarity as they are instructed to "link your arms remembering that you are drinking from your own cup". Guests always shout advice and encouragement, but in truth this simple exercise illustrates that from the very beginning, marriage is about learning to listen to, and cooperate with, each other. Before they can drink, they are told to "sip, close your eyes and make a wish, then kiss." In the meantime, any children present or the witnesses have the job of "finding the cork." We have lots of fun with this part of the ceremony, and fortunately in over 1500 ceremonies we have only lost two corks. Even if it involves bringing out flashlights, the cork must be found! I then split the cork, write the date on it and insert a Cayman coin and present it to the couple with the words of the legend, as a souvenir of their special day in the Cayman Islands. This is my own version of the popular Unity Sand Ceremony, and I love to do this with blended families especially where small children are involved. I do a special ceremony when both the mothers of the couple are present, in which the mothers lay down the foundation of the Memory Vase before the couple add their sand. With children, their coloured sand is in the middle of the Memory Vase, surrounded by sand poured by their mother and/or father. I have written several Unity Sand Ceremonies and customized them for my couples. My personal favourite is called the Colours Sand Ceremony, which is based on the meanings attributed to the colours the wedding couple choose. I always advise couples not to completely fill their Vase but to leave room for tokens, or even sand symbolizing other events, like the birth of a child, a special vacation or a big anniversary. Smith's Cove is a beloved wedding spot, and famous for its small bluff where immediately after being pronounced husband and wife, couples literally take a plunge into the cool waters below. You can also take the plunge off a boat (with or without stingrays) or into the crystal clear waters of Seven Mile Beach. 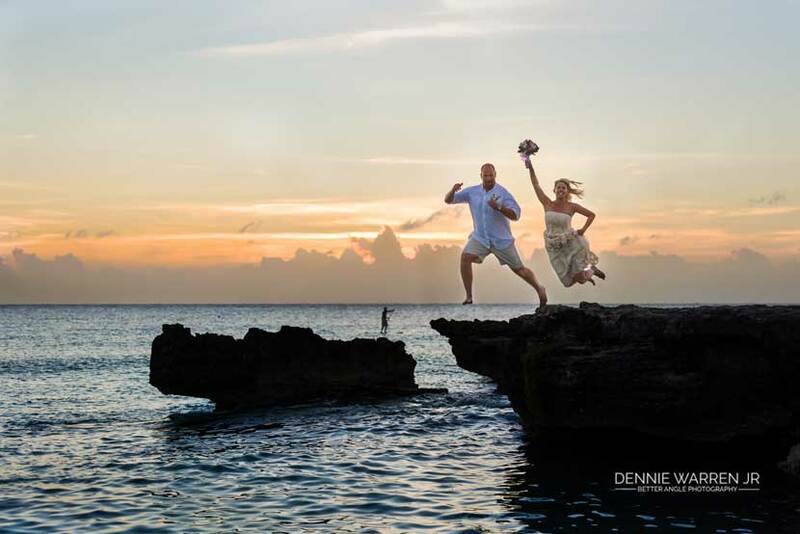 If your wedding involves water in any way then you won't go far wrong getting married in Grand Cayman. My Hungarian groom yesterday arrived by jet-ski to the music of '' Goldfinger"and made a grand entrance not soon forgotten by the delighted guests.